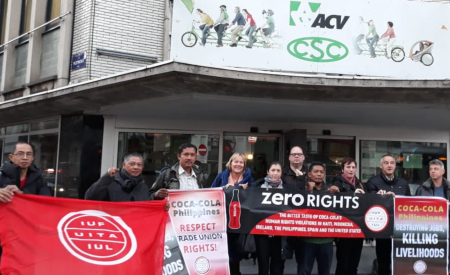 An international IUF campaign delegation made up of union leaders representing Coca-Cola workers in Indonesia and the Philippines visited IUF affiliates organizing Coca-Cola workers in Germany, Belgium and Sweden from November 28 to December 3. The delegation included Lutfi Arifiyanto, the victimized leader of independent union SBMCC at Coca-Cola Amatil Indonesia, Dwi Haryoto, the National President of the Food and Beverage Workers Federation (FSBMM) in Indonesia, and Alfredo De Roja Marañon and Jowen Pasamonte Magcaling, the elected leaders of the Federation of Coca-Cola Unions (FCCU) in the Philippines. They provided IUF affiliates with first-hand updates of the IUF's ongoing 'Coca-Cola Zero Rights' campaign. Prior to the solidarity tour in Europe which ended in Sweden with a visit to LIVS members in the Jordbro Coca-Cola plant on December 3, the delegation intervened at the prestigious UN Forum on Business and Human Rights in Geneva at the end of November to highlight the failure of The Coca-Cola Company to take any meaningful action to remedy ongoing abuses in Haiti, Indonesia, Ireland, the Philippines and the United States. The German Food Workers Union NGG, the Belgian Food and Services Workers Union CCAS-CSC and the Swedish Food Workers' Union LIVS have committed to fight in solidarity with workers struggling to access their rights at Coca-Cola operations in those five countries and to spread the word about The Coca-Cola Company's ongoing serial human rights violations.